Intercessory prayer examples and Prayer Points in the Bible. Intercessory prayer is, where you stand close side by side with another man in the presence of God and support him with your prayer. When praying an intercessory prayer, one makes plea and meditation before God on behalf of oneself but most importantly for others. Jesus Christ, our Lord, shows us a perfect intercessory prayer example in the Bible. Bible says Jesus Christ makes intercession for us at the right hand of God (Romans 8:34). Almighty God, you are the God who can do all things. You reign over all, power and might are in your hands. When you decree, it comes to pass. I praise you today and always, and I thank you for being God. I pray for you today, for the Nations, that your word will have free course in the nations of the world bringing sinners to your love and turning them into Christ Jesus in salvation. God, I pray Lord for my friends and loved ones. They are yet to come to the knowledge of Christ Jesus that the Grace of God will translate them from darkness into light. They will accept Christ Jesus as their savior and Lord. Father, I pray for fellow believers who are week spiritually, that they will be strengthened with might in their inner man by the Holy Spirit. Lord, I pray for my country that your truth will reign supreme and that your light will dispel every darkness. Today, I pray for Grace to abound unto good works that Christ may be glorified in me. 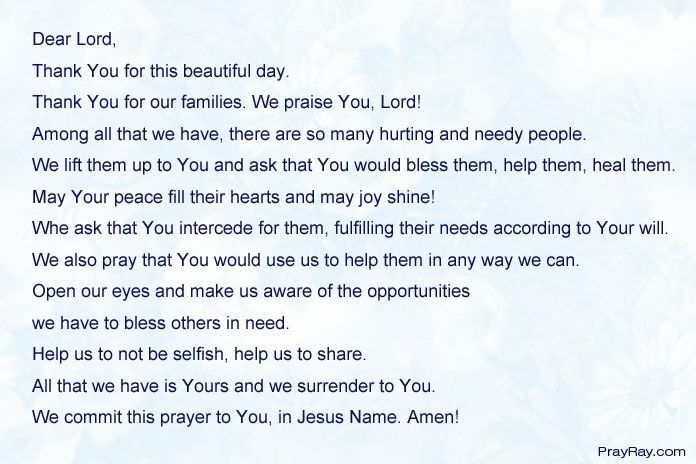 This Intercessory prayer example helps us tarry before God in the place of prayer. We desire that His will be done over our lives, our leaders, the brethren and even sinners. 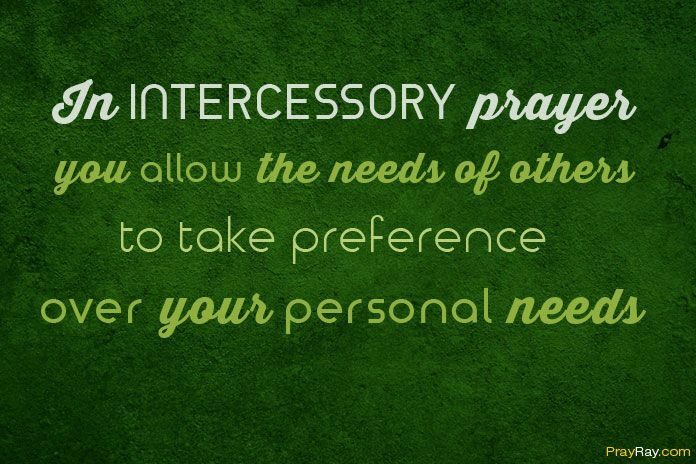 In intercessory prayer, you allow the needs and burdens of others you are praying for to take preference for your personal needs. For the Christian Church all over the world. For the heads of state and peace in the World. For the conversion and salvation of people around the globe. For those who proclaim the Gospel throughout the world. For suffering and deprived people around the world. For the needs of the local communities of believers. For actual events and occasions. Pray with faith, knowing that God has all power and He loves us. Pray regularly. Jesus told us to pray, “Give us this day our daily bread” (Matthew 6:11). It means we should pray every day. Pay in detailed request. Yes, God knows everything, but it’s good for ourselves to clearly understand what we are praying for. Pray with love. God Is Love. Pray with a desire to help where you can. For example, this could be physical help and encouragement. It is good if you tell a person that you are praying for him. It will help encourage them. One intercessory prayer example we can find in Genesis where Abraham made intercession for the city of Sodom and Gomorrah. When the Lord told him about the impending doom on Sodom and Gomorrah, Abraham looked away from his present predicament (not having a child). He stood before the Lord in prayer, interceding for the city of Sodom and Gomorrah so that God’s judgment can pass over the city. Also, we can read intercessory prayer example in the Bible in Genesis 25:21 “And Isaac entreated the LORD for his wife because she was barren: and the LORD was entreated of him, and Rebekah his wife conceived.” Here we see Isaac praying for his wife. Wonderful prayer is in John 17. Jesus prayed for His disciples and for all believers. When engaging in the prayer of intercession, it is expedient for us to know that we need to rely absolutely on the Spirit of God to help us. The Bible says the spirit of God helps us in this ministry. God is looking for intercessors. It is a ministry that every believer should embrace. Then we will see God’s will birthed in our nations. We will know the will of God in the lives of our loved ones as well as sinners around us. And ultimately, we see God come through for us too.